A joyful and hilarious tale of some very spirited septuagenarians as they overcome innumerable obstacles to save their beloved mutt from a heartless exterminator in a land where bureaucracy reigns above all else. Picaresque at its very best. Perhaps you're not a member of the Azov House of Culture Elderly Club? Perhaps you missed the talk on the Cabbage Root Fly last week? Galina Petrovna hasn't missed one since she joined the Club, when she officially became old. But she would much rather be at home with her three-legged dog Boroda. Boroda isn't 'hers' exactly, they belong to each other really, and that's why she doesn't wear a collar. And that's how Mitya The Exterminator got her. And that's why Vasily Semyonovich was arrested. And Galina had to call on Zoya who had to call on Grigory Mikhailovich. And go to Moscow. 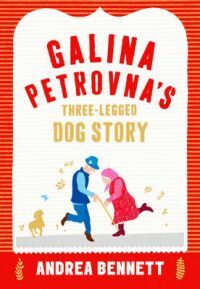 Filled to the brim with pickle, misadventure and tears, Galina Petrovna's Dog Story will leave you smiling at every page. Andrea Bennett graduated from the University of Sheffield in History & Russian and then spent a good part of the "Yeltsin years" living and working in Russia. On her return to the UK she joined the Civil Service - first at the Foreign & Commonwealth Office, then the Department for International Development. A stint in local government followed, and she now works in the charity sector. This is her first novel. She lives in Ramsgate, Kent, with her family and dog.